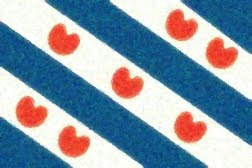 Fun With Frisian: SELSSTANNICH - "independent"
This post will be a change of pace: events are unfolding in Friesland that may have a very real impact on the future of the West Frisian language itself. Omrop Fryslân is facing a potential media merger that could threaten its independent status. The station currently broadcasts vital content including Frisian-language children's programming and the daily news. The employees of the station have written an open letter expressing grave concerns about the merger (available here in Frisian and Dutch). This is an English translation of the letter... any errors are, of course, my own. Please fell free to share this post or translation with anyone who may be interested in the situation in Friesland. There can be no Friesland without an independent broadcasting station. Omrop Fryslân is supposed to be merged with a large, national broadcasting organization from the northern part of the Netherlands. At least, that is the plan that all the regional management boards in our country have thought up and submitted to State Secretary Dekker. The employees of Omrop Fryslân do not agree with this plan and are greatly worried about it. We believe that the station must remain completely independent going into the future. According to the management boards, our editors could remain independent, but we think that this development is the beginning of the end of our autonomy and that the next step is now just around the corner: an increasing loss of control over our own content. One of the most important reasons for the creation of an independent Radio Fryslân in 1988 was to allow us to use our own Frisian language and to allow us to bring our own Frisian culture into the spotlight in the best possible way, with our own broadcast channel. For nearly thirty years, the station has brought the Frisian language and the Frisian culture to your living room. Skûtsje Sailing, the Eleven Cities Tour, cultural events, documentaries, school television, the daily news, and entertainment: all in Frisian or a Frisian dialect. Omrop Fryslân is the only public station that broadcasts in the second national language, Frisian. According to European covenants, Friesland has a right to an autonomous, separate station. The plan for a merger contradicts those agreements. The regional broadcasting directors' plan does not guarantee that Omrop Fryslân can maintain its place as a representative of Frisian culture. As a consequence of the plan, a director from outside the province could decide for organizational reasons that we must stop some of our programs or cease reporting about important events in Friesland. And ultimately, for the same reasons, the Frisian language itself could be marginalized by the merger. That is what we as employees want to prevent at all costs. We are not closing our eyes to reality: there must be cuts, and a lot of other developments are coming our way. Therefore, it is good to work with others such as other groups of journalists in Friesland, as well as businesses outside Friesland. But let this always be based on freedom of choice so that we can always make independent decisions about what is good for Omrop Fryslân: in the end, this ensures that our province will have a free press. We are gladdened by all the responses from people, organizations, and groups who agree with us and who wish to fight shoulder-to-shoulder with us to protect, strengthen, and advance an independent Omrop Fryslân, one which can confidently and passionately look to the future. Omrop Fryslân belongs to all of us and it is important to us that it remains so! Has this since been resolved? Not quite yet from what I am seeing. Still seems to be under discussion, but there may be more news soon.